Thanks, guys! 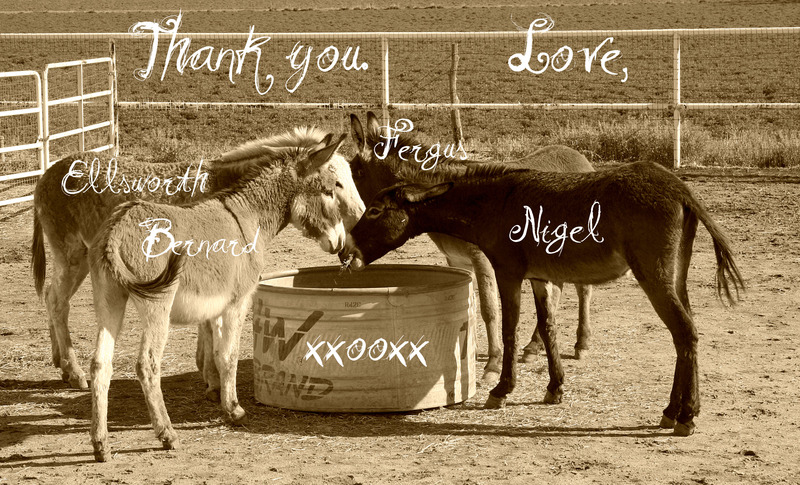 It warms my heart to see two more BLM burros find a home, and now to see all of you getting along…I couldn’t be happier. I can’t wait to hug you all tomorrow. Nigel- perfect name! Looks like they are all getting along, but Nigel is making sure he’s not at the bottom of the pecking order. Love this event/story/scenario. Congrats to adding to your family. They are adorable and look so happy already. Are Ellsworth and Nigel having words? Nigel and Fergus…. now those are some real country boy names. LOL Great choice!! That is the sweetest … a wonderful ‘thank you’ for Aunt Carson and heaven on earth for all four guys! How quickly all the boys are getting along. I love this picture. Looks like lots of fun. Aunt Linda will love meeting the new kids on the block.